Anti-spyware program is an essential security tool for computer system. It is one of the best and most effective ways to remove spyware threats and to maintain your system performance. 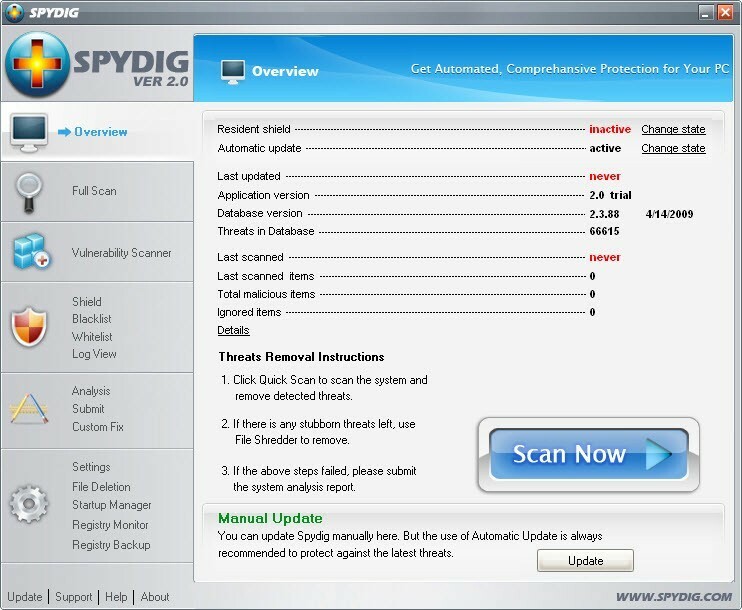 SpyDig, with its free but diverse PC security protection functions, is trusted by lots of computer users all over the world. SpyDig can effectively scans, removes and blocks spyware, Trojans, keyloggers, adware, malicious tracking cookies, browser hijackers, worms, phishing attacks, rootkits, bots, malicious BHOs, dialers and many more spyware threats. SpyDig is fully compatible with the operating system of Windows NT/2000/XP/Vista 32bit. And it is a powerful spyware remover but consumes slightly computer resources. With SpyDig, you can safeguard PC security and enhance PC performance with ease. TrustPort Internet Security - TrustPort Internet Security is a comprehensive protection of your computer from all types of malware. It permanently guards entry points of a computer, including the internet connection and removable memory media. Viruses are immediately eliminated. ByteFence Anti-Malware - ByteFence Anti-malware's cutting edge software detects and removes Trojans, Worms, Spyware, Crapware and other high risk malware. W32/ShakBlades Free Virus Removal Tool - This free virus removal tool will detect and remove W32/ShakBlades Trojan and its variants from your computer. Free Windows Vulnerability Scanner - Protector Plus Free Windows Vulnerability Scanner for April 2015 checks your system for Windows Vulnerabilities.